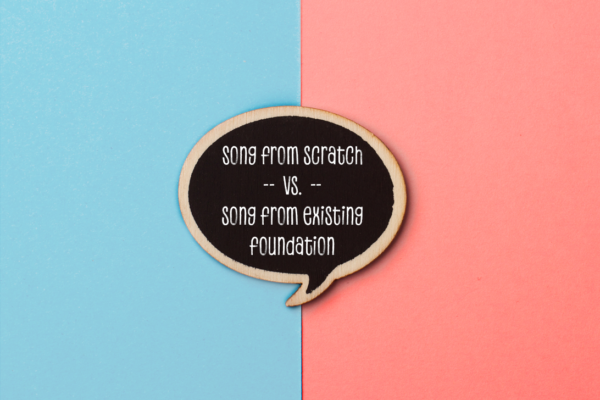 We’re always looking for ways to make our personalized songs better. 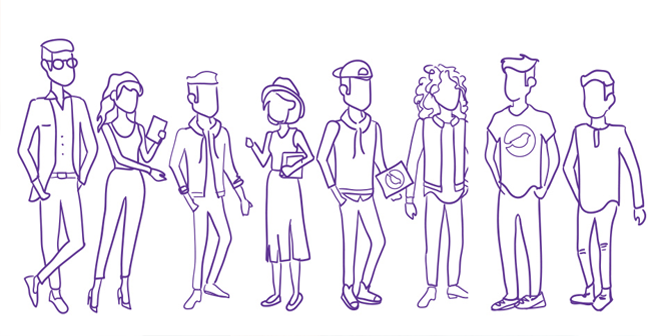 From the creation process to the end product, we’re always pushing for it to be more powerful, more personal, and more accessible. When we talked to many of the beautiful people we created songs for over the past year, there was a reoccurring desire to build a photo slideshow for their spankin’ new song. 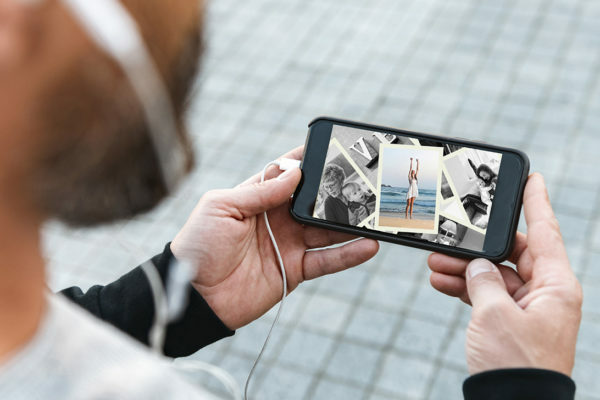 Nothing enhances our songs better than visuals that bring the lyrics to life, so we developed a photo slideshow feature that is simple to use, amplifies the power of your song and offers an incredible delivery method. 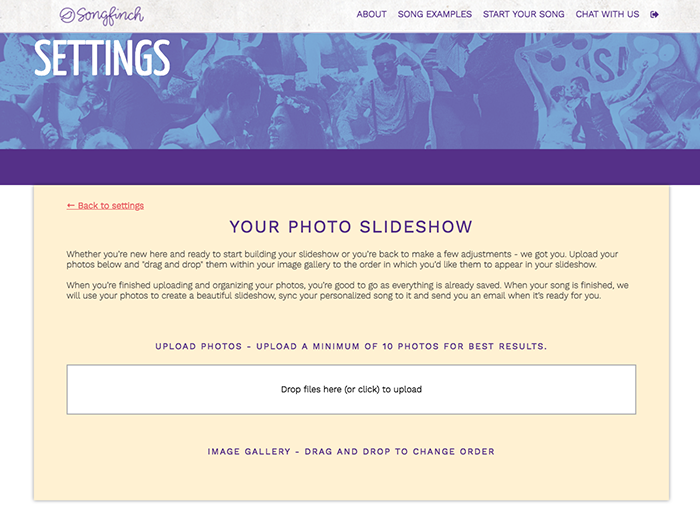 Below is a step by step guide to build your personalized photo slideshow while we create your one-of-a-kind song. 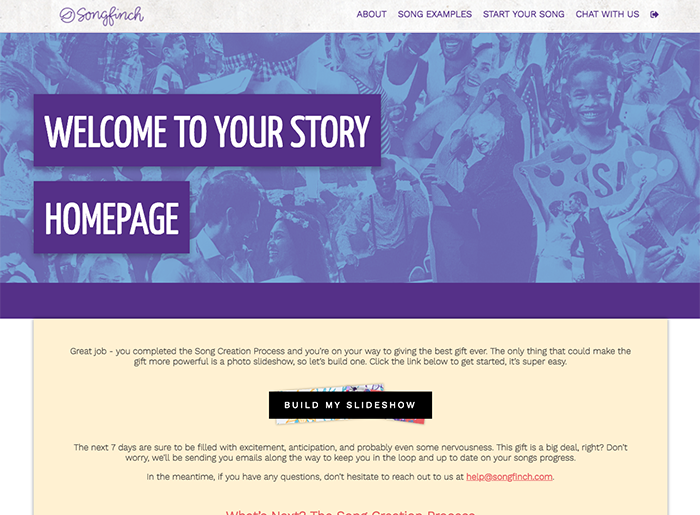 Once you complete the Song Creation Process, you’ll be sent to your Story Homepage where everything will live once your song is complete. Click the “Build My Slideshow” button on this page. You’ll arrive on your Slideshow Settings page where you can begin building your slideshow. Under the Upload Photos section, there’s a white upload box where you can drag photos from your desktop to begin uploading or click the box to select photos from a directory or folder on your computer. Drag or select the photos you’d like to use and you’ll see them appear in your Image Gallery below as they complete uploading. 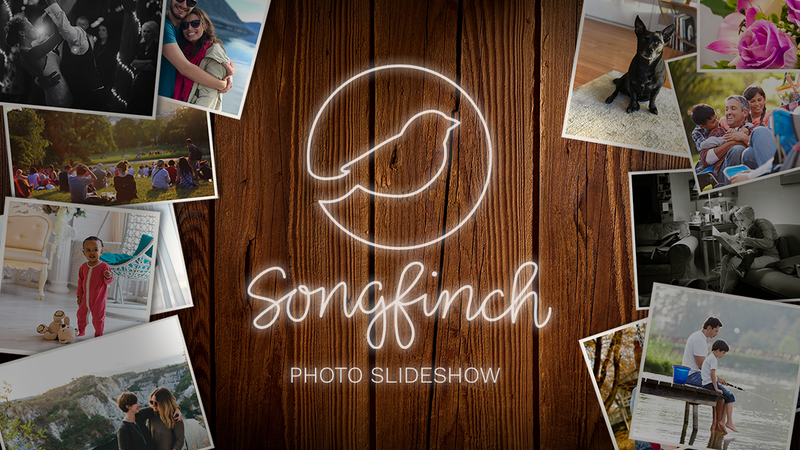 *Tip: Make sure to upload at least 10 photos to ensure we can build your slideshow. However, an ideal amount of photos is around 25-30 to avoid having your photos appear more than once. The exact number of photos required varies depending on song length. You’ll see the photos you uploaded in your Image Gallery with the option to remove them if you’d like. You can also drag and drop the photos in the order in which you’d like them to appear in your photo slideshow. 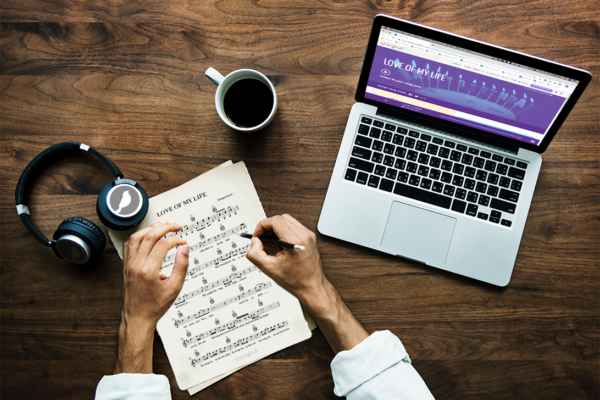 As you make any changes, they will be automatically saved to our database so no need to save your work – we got you. When completed, you can click the “Back to settings” link in the top left of the page to take you to your Story Homepage Settings page. 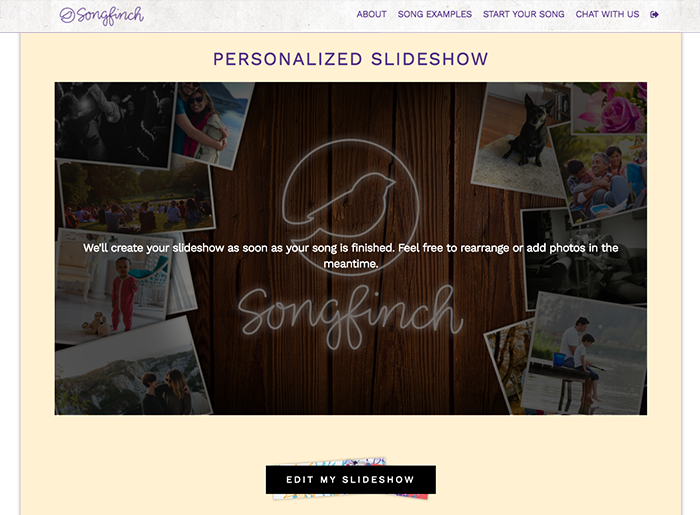 Once you are finished, you can visit your Slideshow Settings page anytime before your song is complete to rearrange or add new photos. 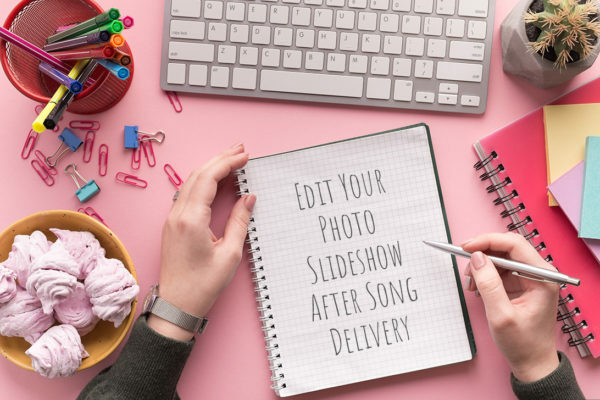 When we receive your completed song from your songwriter, we’ll begin the process of creating your slideshow, syncing your song to it and getting it ready for delivery. 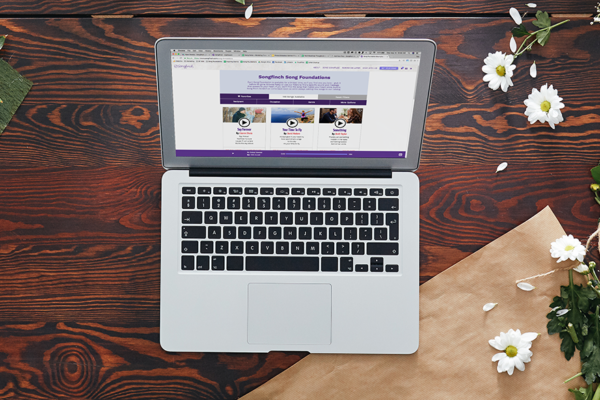 When your slideshow is finished generating, we’ll load it up on your page and send you an email indicating everything is complete and ready for you. You can watch it by clicking the play button at the top of your Story Homepage. If you’d like to download the slideshow, there is a button in the bottom right of the video player that looks like an arrow pointing downward. Click that and your slideshow will download to your computer in MP4 format. If you just want the MP3 of your song, click the “Download” button in the blue box under the video player, to the right of the song lyrics. 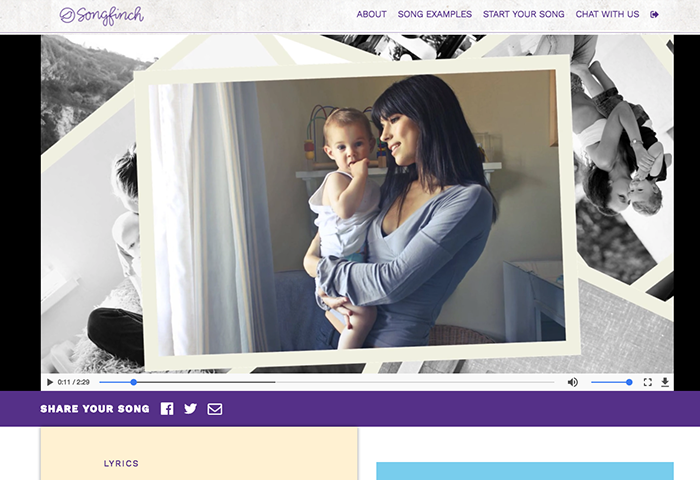 See what our photo slideshows look like with a personalized song synced to it. So crispy, so clean. 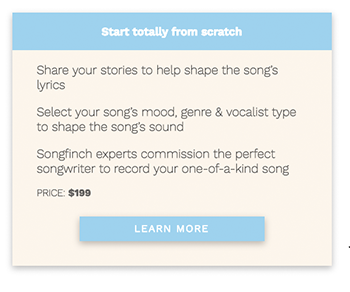 If you have any questions on how anything works, feel free to reach out to help@songfinch.com and we’d be more than happy to help you out. 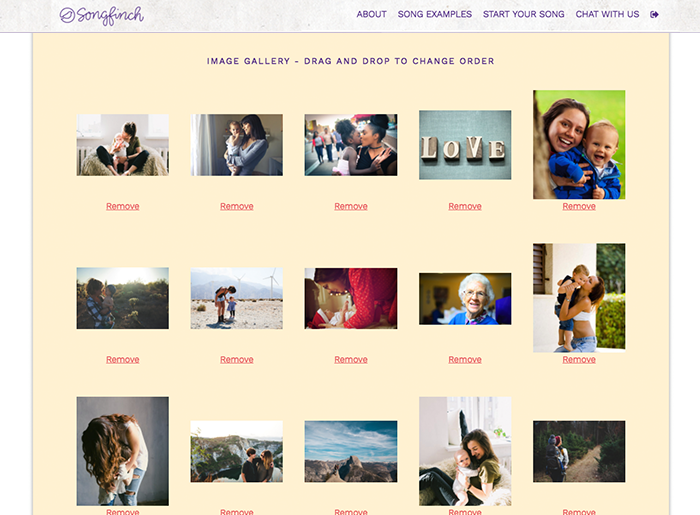 Our Photo Slideshows are included for free with every Song From Scratch purchase. 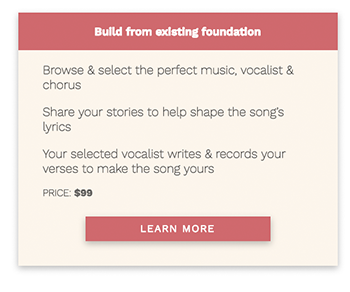 If you’re interested in adding the feature to your Song Foundation, you can add it for only $9.99 here. my daughter had a song made by john russell and added a slideshow for my birthday and it brought me to tears. i still listen to it and watch the video all the time. thank you for what you do!